Fruity, herbal, and spicy, Tradition is an exotic blend of juicy pomegranate, warm cardamom, and savory citrus and nutmeg that transports you to a warm Mediterranean villa. Delightful both during the summer months and the winter. 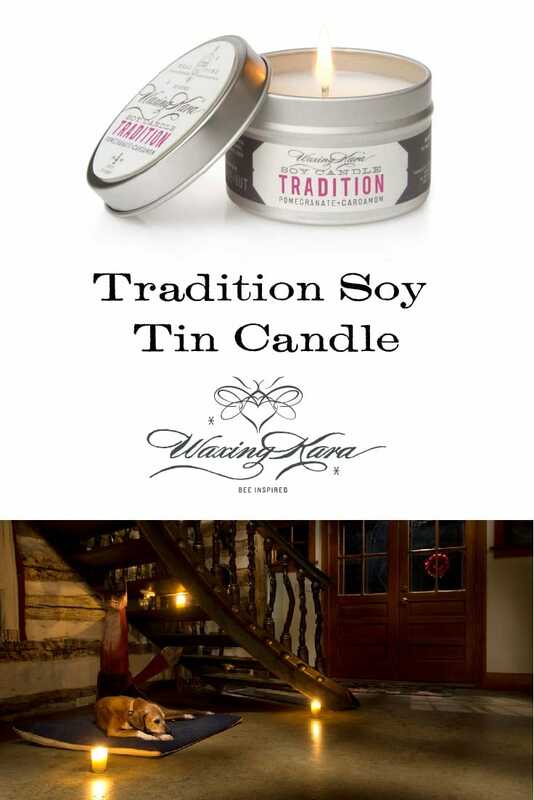 With a fragrance that transports you to distant rivieras and sprawling fruit groves, our Tradition Soy Tin Candle perfumes your home with a vibrant mixture of pomegranate, cardamom, nutmeg, and citrus. Ideal for summer nights on the patio and autumn evenings indoors, Tradition is well rounded for every room in the home. Fragrance: Tangy pomegranate and citrus mixed with spicy nutmeg and cardamom. Ingredients: Natural Soy Wax, Phthalate-Free Fragrance Oil*, 100% Cotton Wick. *The fragrance oil was infused with natural cardamom, nutmeg, orange, apple and pear. I loved how this scent wasn’t overpowering, but it was definitely noticeable. It was fruity and spicy, my favourite combination, and perfect on chilly days.